The Video: From an interview with Bob Roth, on his SiriusXM radio show Success Without Stress. Hear more on the TM technique from Russell Brand, who learned in 2009, here. Bob Roth is a TM teacher and the executive director of the David Lynch Foundation, a nonprofit that provides scholarships for at-risk populations – inner-city school children, soldiers and veterans, domestic abuse victims, etc. – to learn the stress-reducing Transcendental Meditation technique. Tune into Success Without Stress the last Friday of every month at 7pm ET on Sirius XM Indie 102. The Technique: Transcendental Meditation is a simple, natural, effortless technique practiced 20 minutes twice each day while sitting comfortably with the eyes closed. It is easy to learn and enjoyable to practice, and is not a religion, philosophy, or lifestyle. 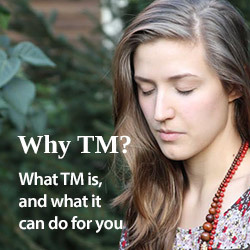 Over six million people have learned it, and 350+ published research studies have found that the TM technique markedly reduces stress, anxiety, and fatigue, and promotes balanced functioning of mind and body.